Just a few days ago, i was asking myself what the future of data storage would be. Some ten or fifteen years ago, it was VCH. ; for me, it was a very horrible experience. One would wind and rewind the cassette tapes, clean with spirit just to be able to have your digital contents available for you to enjoy. Years later came CD, VCD and DVD and of course flash drives( the mother of all disappointing storage technologies, if you agree say YEA). Data, like all things, eventually dies. Your music, your movies, your documents, your files, your computer. You don't expect it to live forever but... what if it did? Hitachi claims that they've developed a new quartz glass plate that can store data forever. CDs and hard drives can only last for a few decades or a century at most, this new quartz glass can "endure extreme temperatures and hostile conditions without degrading, almost forever." How does it work? 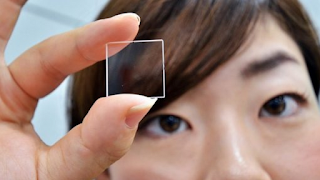 The data is stored in binary form with dots inside a thin sheet of quartz glass. The data is read with an ordinary optical microscope.